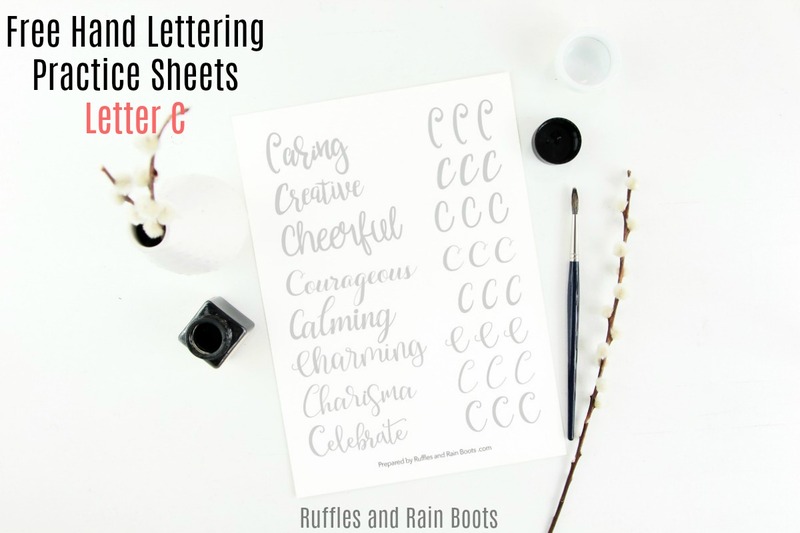 Letter C brush lettering practice sheets are available! If you want to hone in on your hand lettering skills, this free printable set includes brush lettering, bounce lettering, and modern calligraphy lettering styles. Let’s get started! 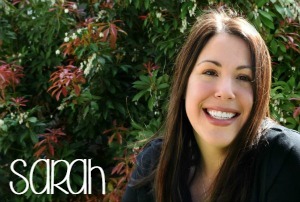 Those are the words I use to describe most brush lettering – I love it! Brush style is something anyone can get great at – heck, the right pens, markers, and brushes can make all the difference in the world. If you’re a beginner, start with one of the following supplies. You will not be disappointed. You don’t have to spend an arm and a leg on supplies, but I strongly believe the right supplies help us get better. We don’t have to war with hard, bounce-resistance tips when there are tools to help us improve. The newest lettering practice sheets can be found on the super-duper secret lettering workbooks page. Just grab your password (on the bottom of every weekly Ruffles and Rain Boots email) and access the Hand Lettering Practice Resources page. Sign up at the link below if you aren’t yet signed up to receive a once-weekly email. You’ll get notified as soon as the newest lettering practice sheets are released! 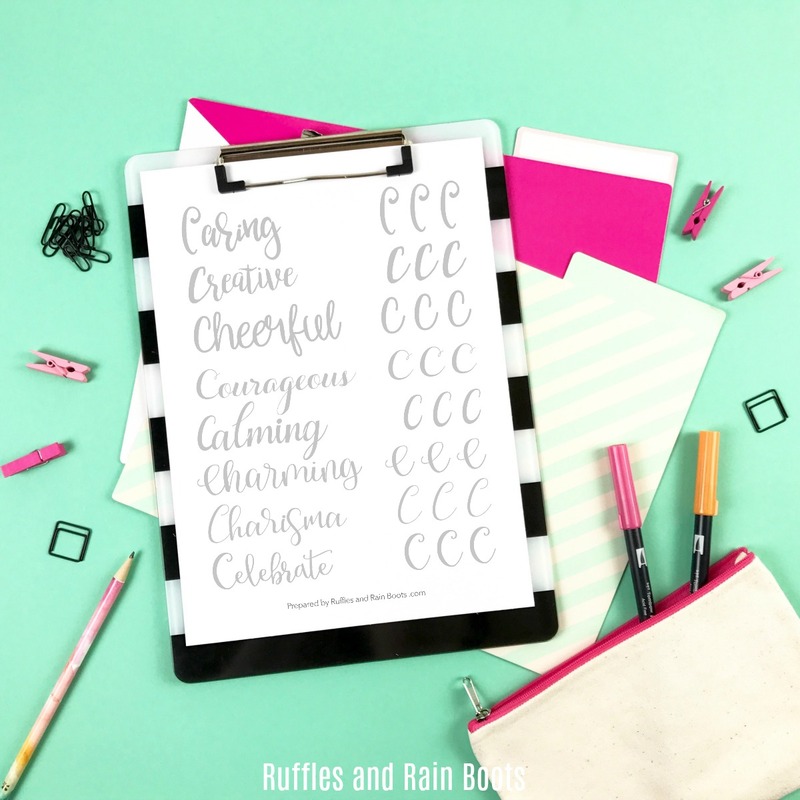 Sign up to receive the Ruffles and Rain Boots weekly newsletter and access to the free hand lettering practice sheets. Psst: You can get the entire hand lettering alphabet for capital letters here! 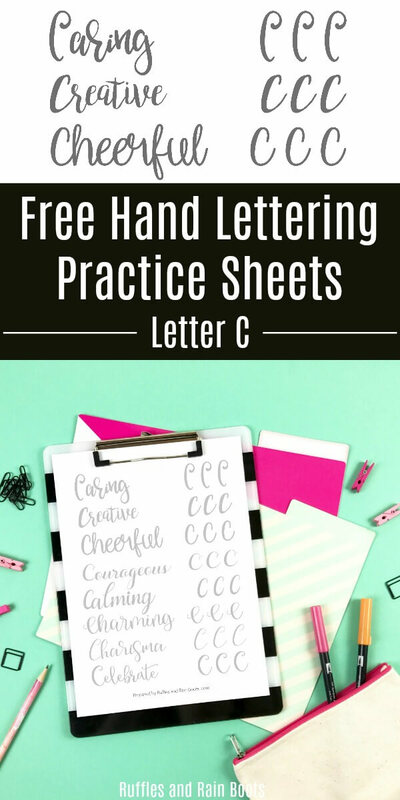 If you haven’t yet, sign up for the newsletter and get the letter C brush lettering practice sheets now. Please share this on your Facebook page or pin it to your favorite lettering Pinterest board. Here’s my hand lettering practice sheets board if you’d like to follow along!